Demand for high-quality, locally produced leafy greens and herbs has increased in major metropolitan areas across the northeast. As a result, the number of commercial greenhouse operations producing these crops has increased in New England states. Because greenhouse growers have the ability to supply heat and supplemental lighting during fall and winter months, there is potential to provide local markets with fresh leafy greens and herbs year-round. The author measures leaf width of kale plants in the Macfarlane Research Greenhouse at UNH. One challenge with greenhouse crops is that since nutrients, temperatures, lighting, and pest controls are provided at such optimal levels, greenhouse environments can cause plants to develop soft growth. Symptoms of soft growth include excessively long stems, plants that fall over, and soft, floppy leaves. When compared to plants that are more compact, crops with soft growth tend to have lower chlorophyll content, which translates to yellow leaf color. They also can have difficulty remaining upright in hydroponic troughs and are more difficult to process during harvest and shipping. Soft growth and yellow leaf color can cause consumers to view these plants as lower quality and not as fresh, reducing marketability and profit. As a result, the ability to control the soft growth of plants is a key area of research for greenhouse growers. A potential strategy to control plant growth is to induce some form of mechanical stress on a plant, such as a strong wind or any other physical disturbance. Some commercial greenhouse growers create physical stress by periodically brushing plants with soft plastic. The brushing creates a physical stress similar to a plant getting blown by the wind. In some plants, this triggers the production of a natural hormone called ethylene, which, among other effects, can lead to shorter, more compact plants. While there is extensive research in certain crops, like tomatoes (Rideout & Overstreet, 2003), there is little research about the efficacy of plant brushing on leafy greens and herbs. During my junior year as a sustainable agriculture and food systems major, I received an Undergraduate Research Award (URA) grant from the Hamel Center for Undergraduate Research to perform an experiment on plant brushing of edible crops grown in the Macfarlane Research Greenhouse, a facility of the New Hampshire Agricultural Experiment Station. 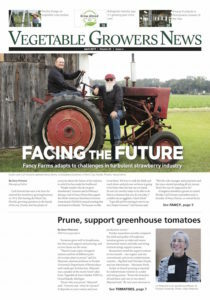 This research is important because the ability to control plant growth can allow growers to improve plant quality and to hold crops past their intended sale date, if needed, thereby increasing potential sales and minimizing loss. Leafy greens and herbs produced in greenhouses are often grown hydroponically using a nutrient film technique (NFT). This technique involves growing plants in narrow gutters, or troughs, positioned at a slight angle, where a thin film of fertilizer solution constantly flows over the plant roots contained within. The fertilizer solution flows from the troughs into a reservoir below the plants, where solution nutrients and pH are adjusted by the grower before being pumped back to each trough (Jones Jr., 2005). Hydroponic NFT systems are relatively low cost, have high water- and nutrient-use efficiency, and are easy to operate. Therefore, these systems are both practical and economical for commercial growers. A challenge facing hydroponic growers is that they have limited options to control soft growth in leafy greens and herb crops. Greenhouse growers raising non-edible crops, such as annual flowers or bedding plants, have the option of applying synthetic growth-regulating hormones, like ethylene. However, these products have not been rated by regulatory agencies for use on vegetative, edible crops, so growers of these crops must look for alternative strategies to control plant growth. I conducted my experiment on greenhouse edibles in the Macfarlane Greenhouses at UNH, Durham. The experiment considered two factors: plant brushing and plant variety. Over the summer I was responsible for constructing a prototype irrigation boom with soft plastic attached to an overhead motor, planting and maintaining the crops, and operating the hydroponic systems used in the trial. One greenhouse bench with a brush and non-brush side. The automatic boom was designed to run once an hour for half the length of the bench before turning back around. To complete this research project, I worked with my mentor, Dr. Ryan Dickson, to develop a research trial to see whether physical stress would reduce soft growth without reducing yields. Lettuce, kale, and basil were grown in nutrient film technique (NFT) hydroponics. Sage, dill, cilantro, parsley, and chives were grown in 4.5-inch containers. In addition, two tomato varieties, three pepper varieties, eggplant, and cabbage seedlings were grown in seedling trays. These seedling crops are often grown in a similar environment before being transplanted into a field or greenhouse, and they tend to stretch very quickly in small seedling trays, making them ideal crops to test. Each plant brushing/plant variety combination was considered a treatment. Seeds for plants grown hydroponically were germinated in 1-inch Oasis® cubes. Seeds for plants grown in 4.5-inch containers and seedling trays were germinated directly into a soilless, peat-based potting media in their respective containers. 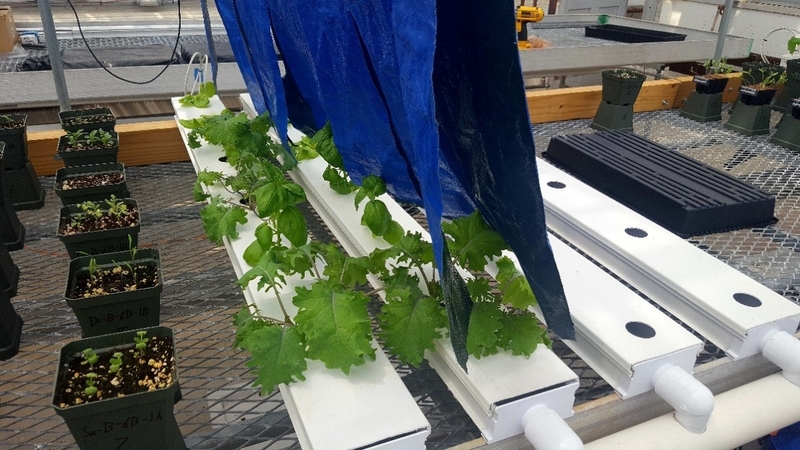 Once the emerged seedlings developed true leaves (approximately fourteen to twenty-one days after planting), Oasis® cubes were transferred to NFT hydroponic systems on top of greenhouse benches. Containers and seedling trays were then placed on the benches next to the hydroponic systems. All plants received mineral nutrients from a commercial, water-soluble, 17-5-17 (N-P2O5-K2O) fertilizer, complete with all essential nutrients and mixed with tap water. Nitrogen in the fertilizer varied between 100ppm and 200ppm, depending on the age of the plant. Younger crops demand less fertilizer, so they received a lower concentration. As plants grew larger, fertilizer concentrations increased as well. The way nutrients were supplied to plants differed for hydroponic crops and crops being grown in pots or seedling trays. Each of the four hydroponic systems consisted of a forty-gallon reservoir that held a fertilizer solution below the bench, plus four hydroponic troughs on top of the bench, connected to the reservoir. A pump constantly moved fertilizer solution from each reservoir to the four troughs connected to it on top of the bench. The solution flowed from one end of each trough, down a slight gradient to the other end, before returning to the reservoir. Each trough contained six plants. The fertilizer solutions in each system was dumped and replaced with fresh solution every fourteen days. For non-hydroponic crops (sage, dill, cilantro, parsley, chives, tomato, pepper, and eggplant), the greenhouse staff or I applied clear water or nutrient solution by a cup to the base of each plant to avoid physically stressing the plant during watering. Soilless potting media can retain fertilizer salts, raising electrical conductivity (EC) and damaging plant roots, so crops were given clear water during the week, and fertilizer once per week. The fertilizer solution was the same as that given to the hydroponic crops. I maintained root zone pH and EC at approximately 6.0 and 1.5mS/cm, respectively, for all hydroponic and non-hydroponic crops. Soft plastic hanging from an automatic boom brushes hydroponic plants. Once the crops were transferred to the greenhouse benches, half of the plants began receiving brushing treatments until they reached maturity: roughly twenty-eight days. All plants in the brushed group were brushed once every hour (twenty-four times per day) with soft plastic hanging from automated travelling booms. Booms consisted of horizontal slotted angle iron attached to a timed motor that moved along a track over the plants. The boom stopped halfway across each greenhouse bench before turning around, so only half of the bench would receive the brushing treatment. The other half of the bench held the control plants. I randomized the location of the brush and no-brush treatments on each bench using a Microsoft Excel randomization function. Light levels and airflow for brushed and non-brushed plants were the same. The only difference that was intentionally introduced between the control plants and brushed plants was the physical stress of the brushing, though certain factors, such as slight genetic variation among individual plants, could not be controlled. After applying brushing treatments for twenty-eight days, we harvested the plants and collected our data. Measurements included plant height (cm), leaf width (cm), and chlorophyll content (leaf “greenness”). Shoot dry mass was collected by harvesting and oven-drying plant tissue at 70°C for forty-eight hours. Kale consumers often complain that they don’t like the petiole, or stalk that attaches the leaf to the stem, and refer to eating them as “eating sticks.” Because of this, we measured the petiole length (cm) for kale instead of plant height. We measured leaf chlorophyll content on each plant using a Minolta SPAD meter. Roughly seven days before harvest of the first round of plants, I planted another round of seedlings. We repeated the experiment with the new plants, totaling four brush and four no-brush treatments for the entirety of the trial. I found the effects of plant brushing to be species dependent, and species that were sensitive to brushing were smaller and more compact at the end of the experiment. Brushing reduced average plant height in basil, sage, and tomato compared to no-brush controls. Brushing also decreased shoot fresh and dry mass in every crop measured, regardless of whether or not crops exhibited a decrease in height. 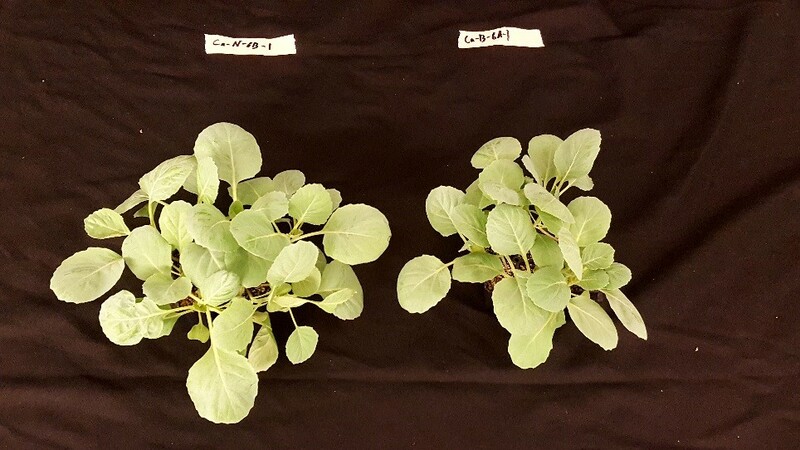 Comparison of cabbage no-brushing (left) and brushing (right) treatments. 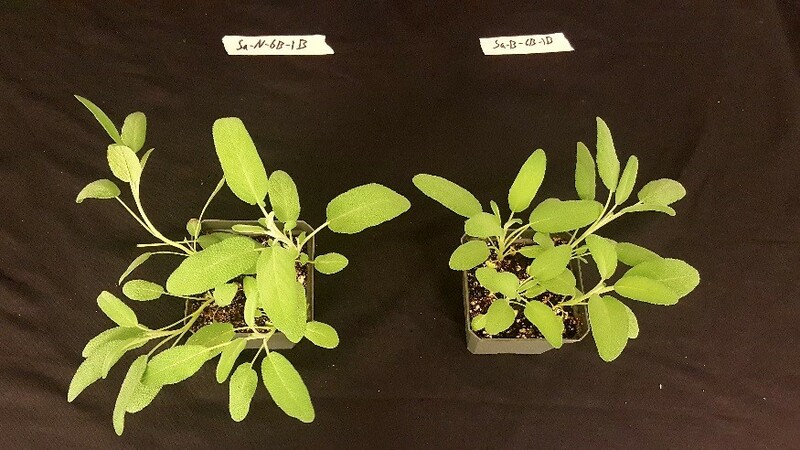 Comparison of sage no-brushing (left) and brushing (right) treatments. I observed that plant brushing had no impact on plant quality as defined by leaf “greenness,” but had a significant impact on growth. Therefore, plant brushing may be an effective strategy to slow plant growth in greenhouse crops and extend the period in which crops can be marketed. More research is needed on the frequency plants should be brushed per day, as well as the efficacy of plant brushing in reducing plant growth time, not just overall biomass. Through this project I learned a great deal about growing greenhouse crops in both soilless substrate systems, like containers filled with inert potting mix, and hydroponic systems. One of the largest learning curves of this experiment was getting to know the cultural needs of each species of edible plant. Specific cultural requirements, such as preferred temperatures, watering schedules, germination times, and days from transplant to maturity, differed for each species, especially in young plants. This required knowledge on each species throughout its life cycle. For example, we originally planned to germinate container crops in seedling trays, then transfer them to containers. In a normal operation, this is the preferred method, but we wanted to begin brushing treatment as soon as true leaves emerged, which was too soon to safely transplant the young crops. So we seeded sage, dill, parsley, cilantro, and chives directly into the containers. By the end of the project, we had refined our cultural techniques for each species, which is valuable and applied knowledge that will add to my ability to produce greenhouse crops. Another challenge involved managing nutrient levels and pH. Solution nutrient levels and pH can change rapidly in hydroponics due to the low pH buffering capacity of most water. During this experience, I had to monitor pH and nutrient levels closely and make periodic adjustments by adding hydrochloric acid (HCl) or sodium hydroxide (NaOH) to nutrient solutions. Nutrient solutions in most leafy green and vegetable crops must be maintained at a pH of approximately 6.0, where most micro and macronutrients are bioavailable for plant uptake. The pH of nutrient solutions at Macfarlane Greenhouse were 6.5–7.0 upon mixture, so we had to lower their pH immediately when putting them into the reservoirs by adding an acid solution to the nutrient reservoir. In addition to learning how to stabilize pH, I learned how pH affects nutrient solubility, the importance of nitrogen fertilizers, and how nitrogen form affects pH. Unlike the plants grown hydroponically, the potted herbs did not experience any pH problems, because the potting mix has a much higher pH buffering capacity than the nutrient solution used in hydroponics. However, the potted herbs did experience a buildup of electrical conductivity (EC). EC is used to determine the amount of salts in a nutrient solution. If EC is too low, it is generally a sign that fertilizer levels are too low. When EC is too high, it is a sign that fertilizer salts have accumulated in the growing media to unsafe levels, causing plants to experience nutrient deficiency symptoms in the form of stunting and yellowing of plant tissue. We originally planned to include cress as part of the trial, but we decided to exclude it due to its high salt sensitivity. These plants were discarded and not used in data analysis. I was able to learn from this challenge and made corrections in pots with high EC by flushing out excess nutrients using clear water, leading to healthier plants for the remainder of the trail. I came to UNH after serving in the Marine Corps, where I spent my enlistment maintaining ejection seats and environmental control systems on FA-18 jet aircraft. Upon completing my enlistment, I searched for a way to put the mechanical skills I learned in the military to use in a field in which I was passionate. I have found that path in hydroponic agriculture. In addition to the practical lessons I learned through this research experience, I had the opportunity to learn about experimental design, troubleshooting and problem solving in agriculture, and techniques in data collection and analysis. Each of the challenges I dealt with during this project will be applied directly in my current and future work. 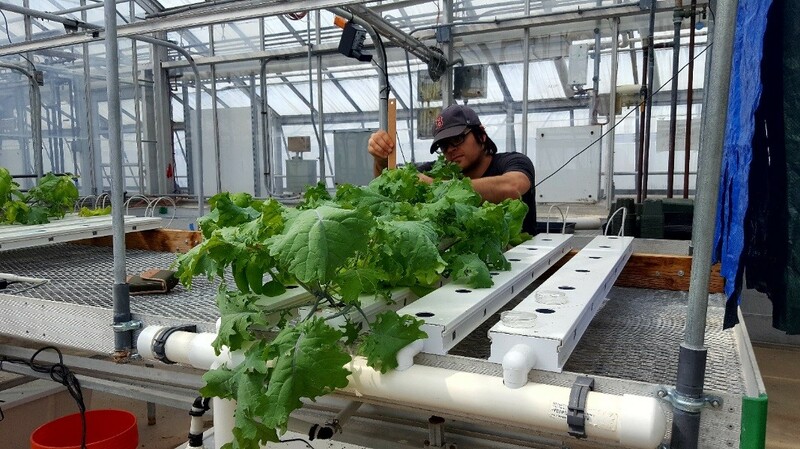 My student-designed emphasis for my undergraduate degree is on soilless agriculture, and this project contributed positively to my degree and helped prepare me for employment in greenhouses. 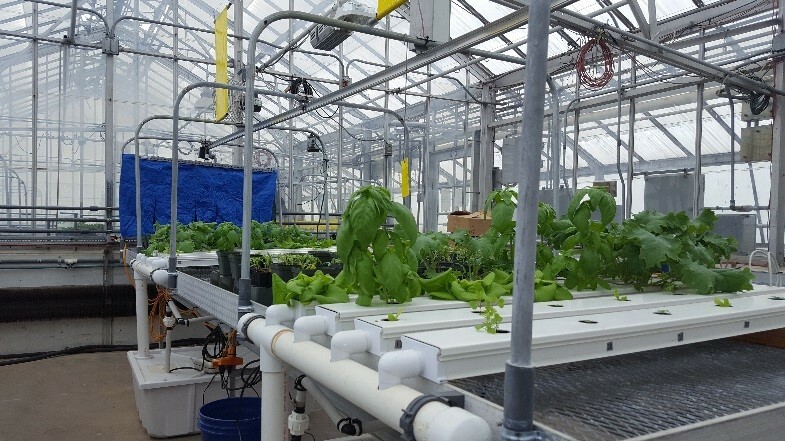 Since completing this project and throughout my senior year at UNH, I have been employed part-time by Hip Peas Farm in Hooksett, New Hampshire to manage growing operations and assist in the construction and management of an aquaponics greenhouse. Upon graduation, I will begin working full-time for Hip Peas Farm as the director of agricultural operations as they establish a farm-to-table restaurant that will focus on sustainable agriculture practices and aquaponics. This material is based upon work supported by the New Hampshire Agricultural Experiment Station, through joint funding of the National Institute of Food and Agriculture, U.S. Department of Agriculture, under award number 1012018. Special thanks to the Hamel Center for Undergraduate Research and Mr. Dana Hamel for the additional grant funding necessary to make this project possible. Additional thanks to Dr. Molly Doyle, administrative director of the Hamel Center for Undergraduate Research; Dr. Rebecca Sideman and Dr. Iago Hale, New Hampshire Agricultural Experiment Station scientists; and, most of all, my mentor Dr. Ryan Dickson, for their combined help in writing the proposal, designing and conducting the experiment, analyzing data, and being supportive throughout the process. Finally, thanks to Macfarlane Research Greenhouse staff David Goudreault, Luke Hydock, and Jonathan Ebba for their help in planning and executing this project. This has been one of the most challenging and rewarding endeavors I have undertaken in my academic career, and without these faculty members, or the assistance of the Hamel Center, I would not have been able to experience this great opportunity. Benton Jones Jr., J. (2005). Hydroponics: a practical guide for the soilless grower (2nd ed.). Boca Raton, FL: CRC Press.